Pragmatics is the component of oral language that is most directly associated with social interactions. Pragmatics governs the use of language in context. 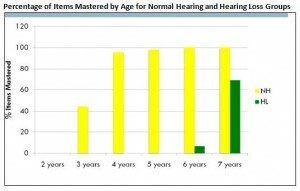 Thanks to recent research by Christie Yoshinaga-Itano and colleagues (see summary below and graph), it is clear that even though children with hearing loss are at very high risk for delays in pragmatic language development. Routinely as children who are deaf or hard of hearing are evaluated for strengths and needs there are language assessments performed. Currently, most popular standardized test batteries of oral language do not include norm-referenced, reliable, and valid measures of pragmatic language. Those that do, often test for knowledge of pragmatics, not the actual behavior of the child. The PLSI is a teacher checklist that has strong psychometrics to be able to clearly identify issues, even for children as young as kindergarten. 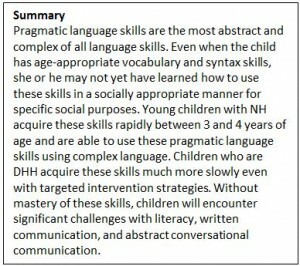 The Pragmatic Language Skills Inventory (PLSI) is an easy-to-use, norm-referenced rating scale designed to assess children’s pragmatic language abilities. Its 45 items can be administered in only 5-10 minutes. Personal Interaction Skills, assesses initiating conversation, asking for help, participating in verbal games, and using appropriate nonverbal communicative gestures. 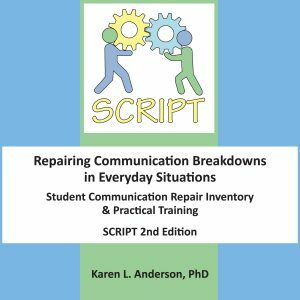 Social Interaction Skills, assesses knowing when to talk and when to listen, understanding classroom rules, taking turns in conversations, and predicting consequences for one’s behavior. Classroom Interaction Skills, assesses using figurative language, maintaining a topic during conversation, explaining how things work, writing a good story, and using slang appropriately. 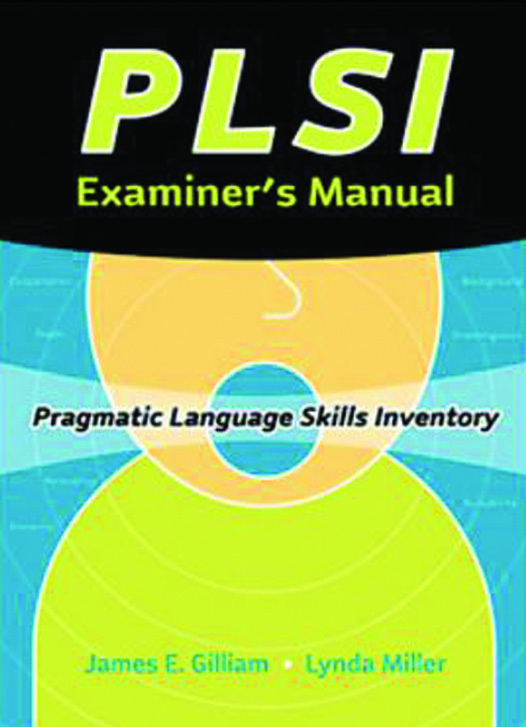 Cut-off scores are provided for determining whether the student exhibits characteristics of a pragmatic language disorder. 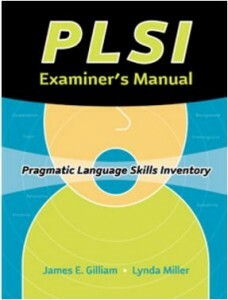 Guidelines are provided to assist the examiner in interpreting the results. Reliability and validity ratings are exceptionally strong and support the use of the PLSI as a diagnostic instrument. 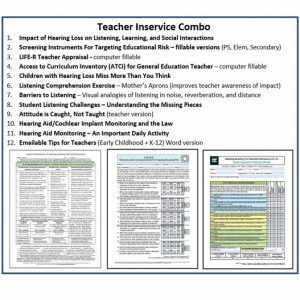 Teachers, early interventionists, and other professionals will find this test useful and thorough. 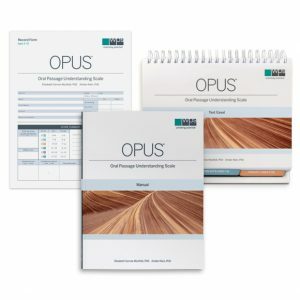 Identify students who have a disorder, document progress in ability, collect data for research, and target pragmatic language goals all with this succinct test, user-friendly test. COMPLETE PLSI KIT INCLUDES: Examiner’s Manual and 25 Summary/Response Forms.